Heartsdesire: Amys MS Read-a-Thon Rewards! You may remember that back in October I posted this article letting everyone know that our eldest daughter Amy was participating in the MS Read-a-Thon. Not surprisingly she read a lot of books! 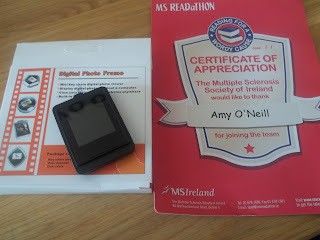 As a thank you for her efforts the charity sent her, just recently, a certificate of appreciation and a small digital photoframe on a key chain. Amy was delighted! 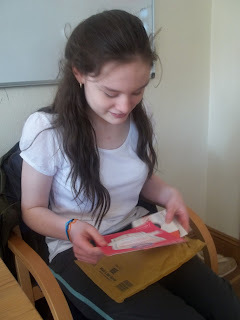 In total Amy managed to raise €91.00 for Multiple Sclerosis Ireland! Way to go Amy! Good for Amy! She has a lot to be proud of. 91 euros? That's 124.42 US dollars!!! That's a lot! Adjusting To Life As A Family Of Five!